I have met Fabiana twice, and both times I found myself completely enamored by her. She is one of the sweetest women I have ever met. So willing to share her vast amount of knowledge, not only as a photographer, but also as a mom, wife, and friend. I seriously cannot say enough great things about her. She truly has left a majorly awesome impression on me. LOVE her. 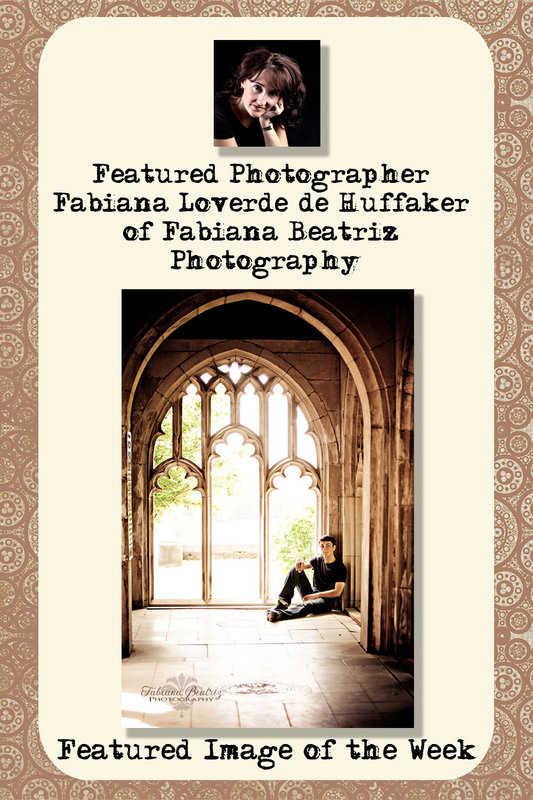 Fabiana Loverde de Huffaker runs Fabiana Beatriz Photography in Eagle, Idaho (a suburb of Boise). Check out her website, blog, and Facebook page. Why do you love this image? I was hired by this young man’s father to fly to Philadelphia and photograph this senior. It was an amazing experience that was capped off by visiting George Washington’s chapel at Valley Forge where this photo was taken. The lighting was beautiful when we visited there and the image merges two of my favorite things: high school seniors and architecture. This spot will always hold a special place in my heart. What were your settings with this image? I love to show people, but especially teenage girls, that they are beautiful just the way that they are. It is an incredible feeling to be able to take a photograph, show them the back of the camera and watch as their self esteem and countenance change. What type of Photography do you specialize in and why? I love photographing children and capturing the way that they see the world. I love photographing families and documenting the way that they interact. I love photographing engagements….most grooms to be will do anything that I ask because they love their future wife so much and want to please her. I love photographing weddings. I feel it is a privilege to document such a monumental day. BUT I LOVE SENIORS THE MOST. The world is at their fingertips and they are celebrating all that they have achieved. It is a priceless experience to walk with them. What are your favorite hobbies and pastimes? Well – the list is long. I crochet, paint, sew, have taught flower arranging and cake decorating, and am an interior designer. I love to cook, and read, and I love, love, love to travel. I am so incredibly blessed to be able to associate with some of the most talented and creative photographers on the planet. You would think that there would be hard feelings amongst such a tight knit, competitive crowd, but they are giving, encouraging, and unselfish. I am also inspired by my talented children who are always game to try new things and to develop their talents. They are my joy in the world. Who are some of your favorite singers/bands? I grew up in the 80’s and love all things from that era. I love dance/hip hop music but also enjoy Andrea Bocelli, Josh Groban, and Michael Buble. So a pretty wide spectrum. Probably the last one that I watched. What would your ideal day be like? Wake up 7:00 am, have breakfast with my family, and head out for a wildly fun senior session. Lunch with my hunny, take a little nap, work in photoshop for a few hours, dinner at Texas Roadhouse, and then shoot a fabulous couple’s engagement session. spend the day at the beach south of Playa del Carmen with my family. Both would work. If you weren’t a photographer, what other profession would you like to pursue? In my past life, I was an Interior Designer. I have substitute taught (teachers do NOT get paid enough), and I also helped my sister start her fabulous home decor store. Any of those things would still be great to do, but photography is my PASSION! Next week, I’ll be featuring Donna Bukalders Photography. I just took a peek at her image that she’s sharing, and it’s gorgeous! Great post Laura! Fabi is an awesome photographer…so willing to share her knowledge with us. Love her! !